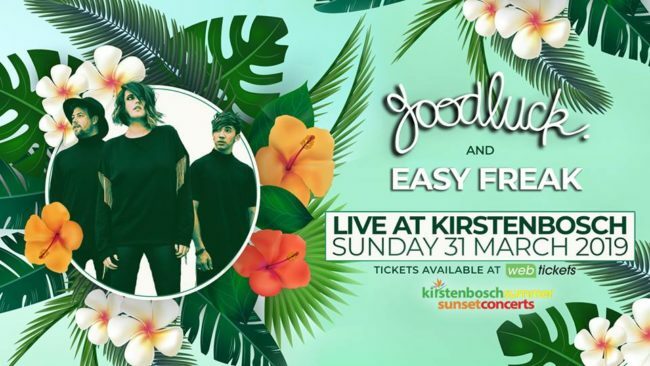 The 2019 Kirstenbosch Summer Sunset Concert series at the Kirstenbosch National Botanical Garden is winding towards its end, with the final concert taking place on Sunday 31 March when popular South African artists GoodLuck and Easy Freak will be entertaining concert-goers. famous flower, landscape and garden show in the world. the concert starts at 5.15pm, finishing at 7pm. Tickets cost R150 for youth (6-21 yrs with ID), R190 for adults and children under 6 are free. You can book tickets online through www.webtickets.co.za or book online and pay in-store at any Pick n Pay store. Please see the event details here.